The best selling stretch film. Good quality for the lowest price! We selected this film for its high quality characteristics: not 1 but 3 co-extruded cast layers provide minimum width reduction when stretched. Excellent cling and toughness. SUPERIOR CLING: ensures loads are safe and stable. HIGH QUALITY: Easy release – Saves time and energy. CLEAR: High clarity makes it easy to read\scan through. 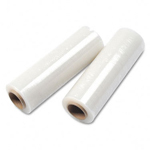 QUIET: Our stretch film is smooth and quiet in use. STRONG AND DURABLE: Can stretch up to 500%.